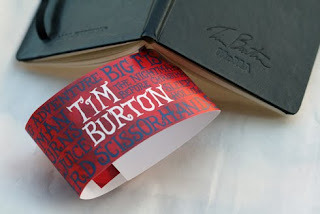 Moleskine helps commemorate the works of Tim Burton with this ‘MoMa Retrospective’ notebook. With These custom 2010 weekly planner were created for VIP Guests of the ‘MoMa Retrospective’ which is running until April 26th. Burton’s signature, and the MoMA logo, is embossed on the front cover as well as a paperband that features some of his film titles, which include Edward Scissorhands, Big Fish, Beetle Juice and others.